The Rhino “carnage” in Africa, and specifically in South Africa has to stop. It has reached a point past genocide and the world should be shouting collectively for it to stop. 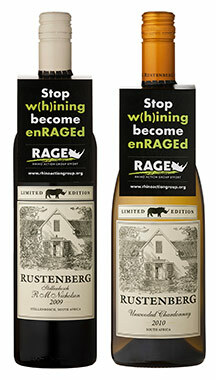 So, Rustenberg, when approached by RAGE, jumped at the opportunity to get involved and chose 2 wines that could carry the RAGE (enRAGEd campaign) labels whereby each bottle sold (bought by consumers) will see Rustenberg contributing R20.00 directly to RAGE, so that these funds can be used to bolster up the campaign against the monsters that are wiping out Africa’s rich heritage. Consumers (the public) always want to get involved in matters that protect the innocent, but often find it difficult to contribute towards the cause, and so the mechanics of this campaign have made it very simple for the public to get involved – they can be assured that R20 / bottle of what they pay for the wines above will indeed end up in the coffers of RAGE, the Rhino Action Group Effort. The funds generated will support the grassroots level fight against the poachers, and so the public know their money is directly assisting with the protection of their (our) heritage. This is no crazy scheme to exploit money from the public by using a sensitive topic, it is a serious, well-structured, well-supported and extremely influential campaign to eradicate the scourge of poaching. Rustenberg Wines, Stellenbosch, and more so the Barlow family who own the farm, are extremely proud to be directly involved with RAGE and have committed 48000 bottles of wine to this campaign and will also endeavour to be more involved as the campaign evolves. The special “enRAGEd” bottles will start hitting South African retail shelves and restaurant winelists as from 23 July 2012 onwards.